Animal Trust - Shrewsbury Veterinary Clinic | Shropshire. 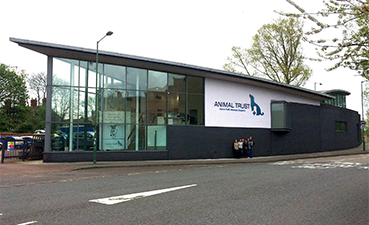 Animal Trust Shrewsbury surgery was established in 2017 and has rapidly become a very popular veterinary surgery. It provides a high level of veterinary care to the pets of Shropshire and beyond. The surgery provides free consultations for all pets and offers a service that extends far beyond the routine. With several vets with further qualifications in medicine and surgery working at the surgery, the team at Shrewsbury are able to offer their patients care at a very high level, while pet owners also benefit from Animal Trust’s not for profit pricing and clear, upfront, philosophy. While the majority of cares seen at Animal Trust Shrewsbury are from pet owners in Shropshire, some pet owners travel very large distances to access services such as total hip replacement, fracture repair or second opinions on medical cases. These are all services that the Shrewsbury surgery is able to offer. The surgery itself is very friendly and is located in the award winning Mansers building in Shrewsbury town centre. It is an exceptionally light and airy facility and makes a very pleasant environment for pets to receive veterinary care form. It also benefits from a large free private car park for those who drive, and a bus stop immediately outside with regular local bus services across Shrewsbury, Church Stretton, Ludlow and Telford. The majority of patients seen are dogs and cats, with the occasional rabbit, guinea pig and various other smaller pets. A designated cat friendly waiting area together with separate cat wards awaits our feline patients to minimise the stress a visit to a vet can cause them. The Shrewsbury surgery is open 7 days a week and runs by an appointment system. Book an appointment online today.